Life ain’t nothin’ but a funny, funny riddle, thank God I’m a country boy,” became more than lyrics from a John Denver song for Ted Vigil. In a way, it has become his theme song. Vigil grew up with music as a huge part of his life coming from a mom who taught him and his siblings to sing and growing up in Catholic school and church. “My mother played piano and sang, and that was part of our routine. 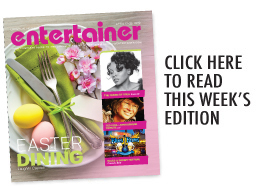 We’d get in the car, and we would sing songs,” he told the Laughlin entertainer. “She would teach us songs, and that was a way for us not to kill each other in the backseat, my siblings and I, he said with a laugh. “So I learned to sing at a young age and I loved to sing. I sang in school plays, I sang for the folk mass. In fact, one of the songs we sang was ‘Follow Me’ by John Denver. He played drums and sang in rock bands in and around Washington state where he still calls home, but all of that had to move to the back burner when Vigil got married and raised a family. But when the kids grew up and moved out, Vigil wanted to get back into his first true love, singing. This is where that “funny, funny riddle,” or weird twist of fate comes in. Vigil started competing in singing contests and he won his area contest in Washington. That earned him a trip to Laughlin to compete in the national finals of Talent Quest, one of the biggest contests of its kind in the world. “I sang a Tim McGraw song, I advanced. I sang a Montgomery Gentry song, I advanced. 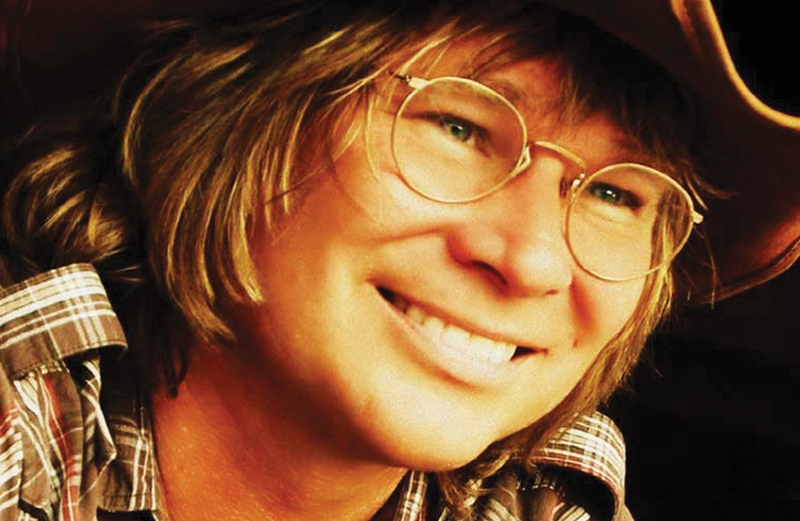 I found myself in the top 20 and after a lot of people telling me how much I looked like John Denver, and saying ‘you should really think about doing a John Denver song,’ I did. 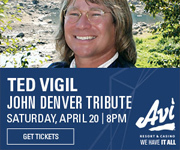 So for a guy to take all of that unto himself to create a musical tribute to Denver takes courage, but Ted Vigil is bold like that. He also knows how to take a hint. Friends suggested that he open for an Elvis tribute guy named Danny Vernon and the die was cast. “I think I sang three or four songs. I didn’t even play a guitar then I just sang to tracks,” he said. “It was for this little casino show in Washington state, but people loved it. I had the voice, but I didn’t play guitar. He was doing his own solo gigs when fate stepped in once again. While Vigil already had the look taken care of, the vocals were a bit more challenging. “Some people say, ‘You sound just like him,’ some people say, ‘Oh, you kind of sound like him,’ everybody has their opinion…’John was taller, John was shorter…it’s funny, everyone has their own perception. But what I find at my shows is people just go back in time. They get to relive the memories when those songs were coming out and they were young and in love, or whatever was going on in their life. “It’s really a special thing to be involved in a tribute like this, especially with somebody like John Denver who touched so many people’s hearts and the music is just very heartwarming. I find that with songs like ‘Annie’s Song,’ people say, ‘we got married to that’, or ‘that’s our anniversary song.’ ‘Sunshine on My Shoulder’ means a lot to a lot of people too,” he said. Because Denver passed in the ’90s, do young people know who he is? “It’s funny because I get people coming to my shows that are 9 and 10 years old,” he said. “I get kids that they have just fallen in love with John’s music and his persona, and that has a lot to do with YouTube. And kids, they’ll get hooked on it, and then they’ll learn the music. Vigil’s biggest challenge however, wasn’t really the vocals. “I think it’s the pressure of going out on a stage and the expectations that people have,” he explained. “The hardest part for me — it’s almost like, I become that person, I become John to them. So I’m very concerned about how I look, how I sound. I take a lot of time in my life running, working out, and working on the songs, but the hardest part is the expectation that people have that I need to fulfill. Then, of course, there are the songs he has to do, no matter what. “I would have to say, just because of the response, and the fulfillment of singing a song, and having three or four hundred people stand up and sing at the top of their lungs it’s ‘Take Me Home, Country Roads,'” he said. “That’s just an amazing feeling when you have that — it’s almost like a religious experience. They drown us out when we’re singing and it’s a cool experience. “But as far as challenging one of the other songs I really love to sing is ‘Rocky Mountain High’ and I open my show with that. It’s got a lot of lyrics to it, but it’s such a cool guitar riff, it’s very poetic, and just the story of it — it’s just a really great song. It’s one of his best, I think. Vigil brings a small ensemble of musicians to town for his show at the Avi Resort & Casino. “I’m gonna have a world-class fiddle player from the Seattle area and then I have a keyboard player with a dynamite voice,” he said. “I started out doing this show with a bigger band, but I have found this is kind of a really nice combination because I have all the elements and you still hear all the lyrics which is really important with John’s music. My crowd doesn’t want it loud, they want to hear the songs and the melody, they want to feel the emotion, so it’s a real great lineup I’m bringing to the Avi and I know people are going to enjoy it. It’s very interactive and I’m looking forward to it. 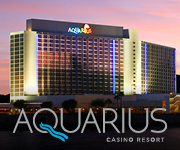 “Going back to Laughlin is going to be cool because that’s where it really started for me,” he said. “If you would have told me 15 years ago, ‘Ted, you’re gonna be doing a John Denver tribute and you’re gonna be making a living, and travel the world doing this, and you’re gonna be playing guitar and singing songs’, I would have said, you’re crazy! But it was the result of that contest.